Tanya is a research technician working with Ken Johnson and his lab. Tanya is primarily involved in managing the processing of SOCCOM (Southern Ocean Carbon and Climate Observation and Modeling Program) biogeochemical profiling float data. 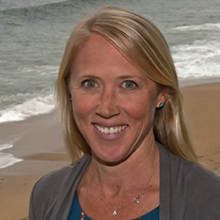 Tanya comes to MBARI most recently as an Oceanographer at the Naval Research Laboratory (NRL) in Monterey. Prior to this position, Tanya supported NRL as a Scientific Programmer through the consulting firm, Devine Consulting, Inc. Tanya’s work experience also includes several years at Moss Landing Marine Laboratories. She holds a Master’s degree in Marine Science (Physical Oceanography) from California State University Monterey Bay.